The new cultural hotspot in Málaga is the district of Soho. It is situated in between the city center and the sea and has a lot of different things to offer. Should you be a student of our school in the center you’re lucky….then you are already right in the middle of it as OnSpain is located in Soho itself. So how about you take a little detour on your way to or from school to explore this incredibly cool part of town? Next to many bars and cafes, you can find important cultural facilities in this area of the city like the Contemporary Art Museum and the Teatro Alameda. In the last couple of years, the inhabitants and business owners of the district have decided to transform their part of the city into a new cultural center, starting by forming the civil association ‘Soho Málaga’. One initiative they took to make the Soho more artsy, was establishing the MAUS (Málaga Arte Urbano Soho) festival, with an urban music festival, urban markets, video installations and practical workshops. They even invited a handful of famous national and international street artists and commissioned them to do artworks all around the area. Therefore, Soho is full of street art, ranging from graffities, over stencils to posters. It doesn’t matter which corner you turn, you will come across some kind of artwork – some more famous than others. So-called ‘Muros Libres’ (free walls), which are there to be filled by local artists, are mixed with commissioned artwork done by famous street artists from all around the world. Being spray painted on one of the tallest buildings in the city, this impressive mural of a fighter pilot is really hard to miss. Done by Dean Stockton, a famous british street artist, this massive graffiti represents all the typical influences that inspire the artist, ranging from comics to the star system. 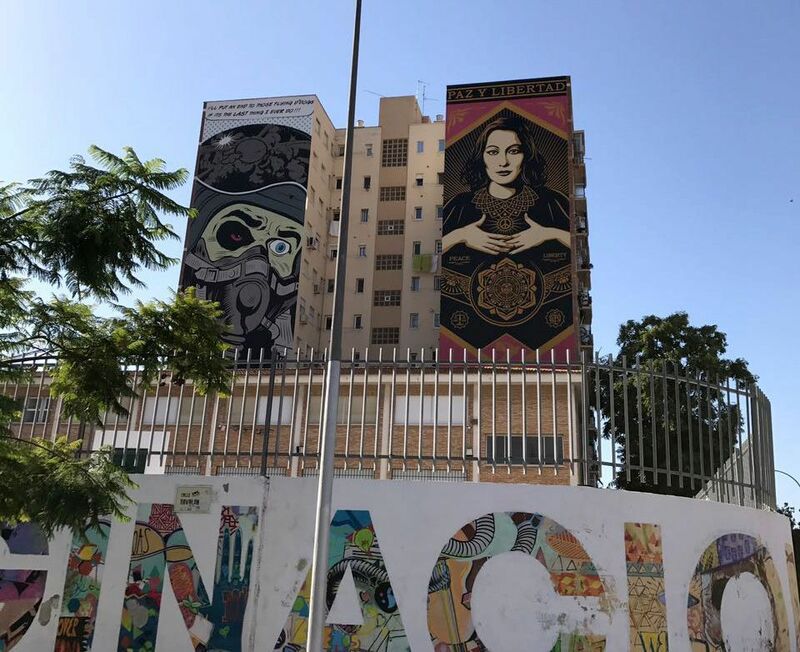 The impressive mural right next to D*Face’s fighter pilot, depicting a woman and displaying the words “Paz y Libertad” (Peace and Liberty) is the work of famous American street artist Shepard Fairey, better known as OBEY. That name probably rings a bell with most of you as it is also the name of Fairey’s clothing line. 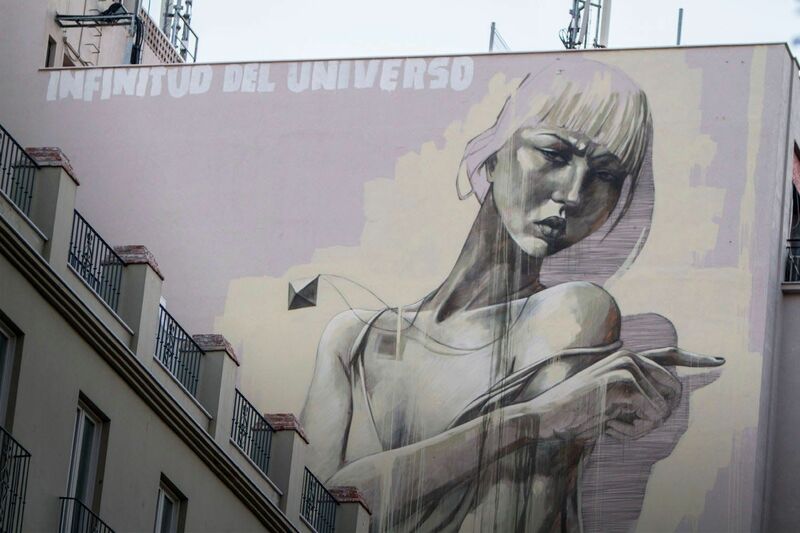 His artwork in Málaga is said to depict his wife Amanda but he has also created works with more recognizable faces, as the famous “HOPE” poster for the 2008 presidential campaign of Barack Obama. The beautiful black and white image of a woman is due to South-African street artist Faith47. Being one of the few well-renowned women in the street art scene, her works stand out through their feminist topics. Other important focus points of her work are injustice, poverty and environmental issues, all things she has experienced while growing up in post-apartheid South-Africa. 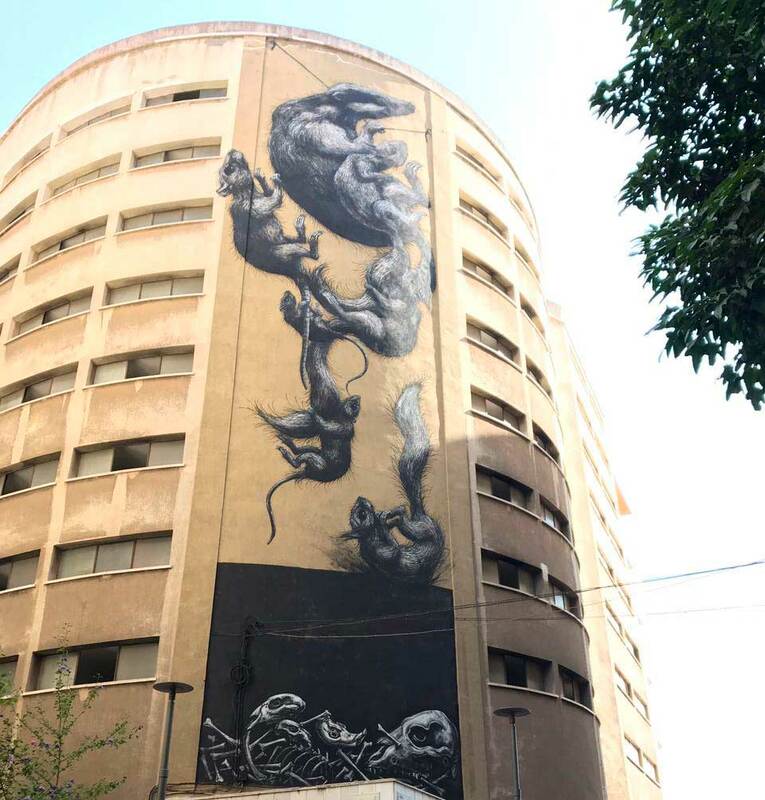 Belgian artist ROA put his stamp on the city twice with a giant mural of several rats and a mural showing a chameleon. The animals he chooses for his works are always local to the area he works in and it is believed that it is his intention to symbolically return the animals that had been driven away once the respective cities have been built, to their natural habitats. There are, of course, a lot more beautiful, fascinating and bizarre graffities by many more artists to see in Soho. So in case I awakened your interest, take some time, pack a camera and go explore the art district of Málaga.